Are you aware that the 2011 MacBook Air has a six gigabit-per-second (6Gb/s) internal storage interface? Yet Apple chooses to ship it with a 3Gb/s Samsung or Toshiba flash storage module. 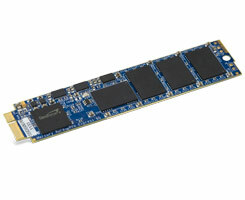 Other World Computing is offering an easy upgrade to a 6Gb/s flash storage module called the Mercury Aura Pro Express 6G. Why would you want to upgrade? With the 4GB RAM "hard wired" limit on the MacBook Air, you will force numerous virtual memory swaps if you have a lot of apps launched and running. Also certain Pro Apps need gobs of RAM to function efficiently. If they don't have access to it, they will use the flash storage for scratch area. So how much storage speed does it add to the 2011 MacBook Pro? Take a look at the graphs below. Notice we included the results for two Thunderbolt enclosures with dual 6G SSD RAID 0 set. The Test "Mule" was a 2011 MacBook Air 1.8GHz Dual-Core i7 running OS X Lion 10.7.2. Using various small test sizes (4K to 1024K), we ran through 5 test cycles. Below is the average. This can be predictive of typical of OS X and application disk activity. RED bar indicates the fastest. The Terminal based version of DiskTester 2.0 includes a test that measures how many random 4K reads and writes can be performed in a second. RED bar indicates the fastest. This is a sequential test using 20M to 100M test sizes. We averaged 5 cycles. RED bar indicates the fastest. 1. The OWC Mercury Aura Pro Express 6G flash storage module was approximately twice as fast as the Apple factory Samsung flash storage in the QuickBench small random and large sequential data transfers. The Aura performs three times as many small random reads per second as the Apple factory flash storage and 35% more writes per second. 2. In the Finder Duplicate test, the Aura was 29% faster than the Factory Samsung flash storage. 3. The Aura was surprisingly slower than the Factory Samsung in the Restart test, but both the Aura and Factory Samsung flash storage modules Restarted faster than both Thunderbolt RAID 0 boot volumes. 4. As good as the Thunderbolt enclosures are with 6G SSDs, counting the SSDs, they are two to three times as expensive as the internal 6G SSD kit of comparable capacity. And both Thunderbolt enclosures require AC power. If you want speed and mobility, the SSD upgrade is the way to go. 5. One very important advantage of the Aura Pro Express does not show up in the graphs. I'm speaking of the OS independent intelligent block management, intelligent wear leveling, intelligent read disturb management, intelligent recycling, redundant array of independent silicon elements, and advanced ECC protection. It is much more sophisticated than the OS dependent TRIM support in the Apple factory flash module. Before you touch any internal components, it is recommended that you wear a grounding strap and disconnect the battery from the logic board.Once the back cover is removed, you will see one screw securing the factory flash storage module. Another tool provided by OWC removes that. We pulled the factory flash storage module out, put it in a static suppression bag, and inserted the OWC 6Gb/s flash storage module. Replace the holding screw and reconnect the battery to the logic board. The back cover can now be replaced. The ten "cosmetic" screws can be inserted in their proper hole and tightened with the correct tool. Lastly we booted OS X from the Thunderbolt enclosure and cloned it to the new storage module. An exact duplicate of the orginal factory drive insures that the Restart test is a fair fight. Visit Other World Computing to price the Aura Pro Express 6G 240GB and 480GB flash storage upgrade kits for the 2011 MacBook Air. They also have flash storage upgrades for older models of MacBook Air.